Compared to the antiquity of some of the long barrows and stone circles we feature here Tintern Abbey is a relative newcomer being founded in 1131 by Walter de Clare, Lord of Chepstow. It was the second Cistercian foundation in Britain and the first in Wales. The White Monks who lived there for over 400 years followed the rule of St.Benedict (obedience, poverty, chastity) and the Abbey received surrounding land into its jurisdiction. The Abbey was built of old red sandstone, varying from purple to grey, which gave it a certain attractive atmosphere. 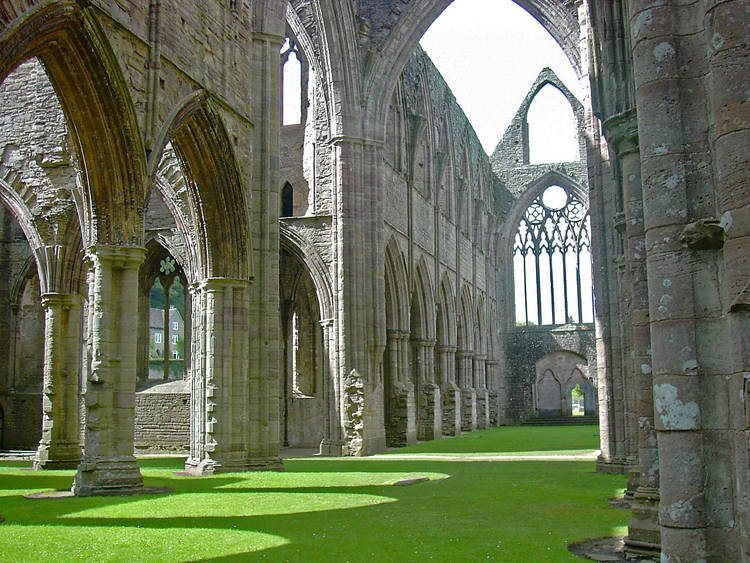 After the Dissolution of the Monasteries in the 16th century Tintern fell into ruin but was kept in in public consciousness by being celebrated in poetry and painting which led to an increase in visitors from the 18th century onwards. There is ‘just something’ about Tintern! Situated in the beautiful Wye Valley it sends out a romantic call from within its ruined splendour. Wordsworth used it in the title of his poem ‘Lines written a few miles above Tintern Abbey’ (1798) and Tennyson composed ‘Tears, Idle Tears’ (1847) while visiting the Abbey. ‘Bardic, O Self, Visitacione, tell naught/but what seen by one man in a vale in Albion/of the folk, whose physical sciences end in Ecology/the wisdom of earthly relations.’ (Allen Ginsberg ‘Selected Poems’ 1996 Penguin Books.